Last week we finally managed to get the wool away to market. We loaded it up on the Sunday and then we took it on the Monday morning. 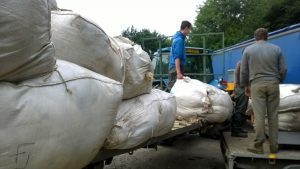 The fleeces are packed into wool sheets for loading. We had mostly Dalesbred and Masham wool with some Texel fleeces too. A Masham ewe normally has 3kg of wool on and a Dalesbred normally has about 2kg. We used to sell the wool to the British Wool Board, but a few years ago we changed and started selling it to the Irish Wool Board. We find this is a much better place to sell the wool to, as we find out on the day how much the wool cheque will be and we don’t have to travel to the Wool Board at Bradford. Dalesbred wool is worth 38 pence per kg and Masham wool is worth 85 pence per kg because it is a better quality wool. We also had a few Texel fleeces off the Texel rams and they are worth about the same as Masham wool. Usually, we put them together, but we kept them separate this year to see if it was worth doing although we didn’t really gain anything in the end. The wool that is worth the most is Blue Faced Leicester. This is worth £1.50 per kg – with only three rams that we clipped it was definitely worth keeping this separate from the other wool. On Monday morning, there were six farmers who get together with all their wool. They weighed the wool sheets and then they were loaded onto a wagon. Everyone helped one another. There were two people putting them on the scale and another two putting them onto the wagon. When we started unloading our trailer, all the Dalesbred sheets and Masham sheets were mixed up but my brother said not to bother sorting the sheets, as there were some heavy Masham ones to come. But no one expected them to be quite that heavy. Normally, there are two sheets of wool put on at once, but we could only manage one Masham sheet at a time as they weighed so much more. Some people said that they were going to break the scales! As we sell the wool to the Irish Wool Board, it is all exported and most of it goes to China. We send the wool on the Monday and by the Saturday, we had the wool cheque. The only down side with wherever we sell the wool, is that Dalesbred wool is classed as the same as Swaledale wool, even though Dalesbred wool is better quality. This year we were lucky, and we did manage to get a few pence more. It all helps! On our farm we do all our own clipping. To pay contractors to do it would cost £1 a sheep, so it could end up costing more to produce the wool than we’d get for selling it. Regardless of whether we make any money it’s a job that has to be done, as the countryside doesn’t want to be covered in wool!